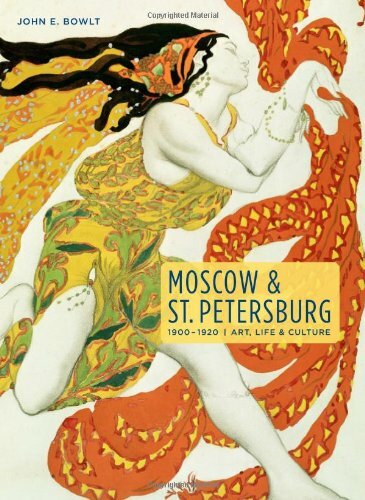 Lavishly illustrated, Moscow & St. Petersburg 1900–1920 is the quintessential guide to Russia’s vibrant and influential Silver Age. In this elegantly written narrative survey, John E. Bowlt sheds new light on Russia’s Silver Age, the period of artistic renaissance that flourished as Imperial Russia’s power waned. Much of the creative energy could be attributed to the Symbolist movement, whose proponents sought to transcend the barriers of bourgeois civility and whose unconventional lifestyles led some critics to label them Decadents and Degenerates. But, as Sergei Diaghilev declared, theirs was not a moral or artistic decline, but a voyage of inner discovery and a reinvention of a national culture. Bowlt’s richly textured volume focuses not only on Russia’s best known artists from this period—Diaghilev and the Ballets Russes, Igor Stravinsky, Anna Pavlova and poet Anna Akhmatova—but also on lesser known movements of the period—experimental theater, Nikolai Kalmakov’s innovative painting, and the free dance practiced by followers of Duncan and Dalcroze.